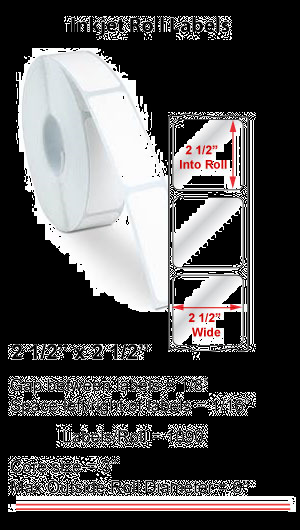 ROLL OF 1090 CONTINUOUS 2 1/2 x 2 1/2 INKJET ROLL LABELS W/ NO PERF. Available in White Uncoated, White Premium Matte, White Semi-Gloss, White ViVidGloss, Brown Kraft, Matte Poly and PolyGloss. 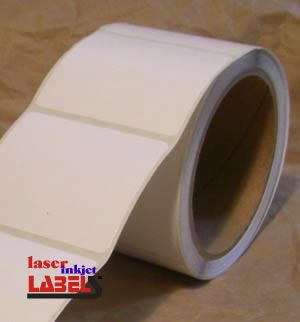 All label materials have a permanent adhesive. 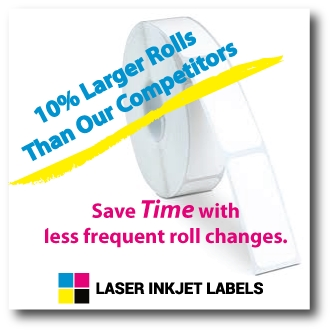 This premium matte label material is designed to be compatible with most desktop roll to roll ink jet printers. Prints excellent photo images, color graphics, and sharp text. It has good water fastness and wet-rub characteristics. White PolyGloss is our 2 mil white BOPP film with a matte finish that locks down inks. Matte Poly is a water-resistant label with a photo quality printing, permanent adhesive and can get wet without smearing. While no label is smear or waterproof unless laminated or varnished but our Matte Poly is the next best thing.